In the minds of many, body fat is erroneously regarded as nothing more than a non-functional, inert repository for excessively consumed food calories that lazy or otherwise inactive people fail to “burn off.” However, science has provided irrefutable evidence that body fat, particularly excess body fat, is actively involved in metabolic activities that can be very harmful to the human body. “Cytokines” are small secreted proteins released by cells that have a specific effect on the interactions and communications between cells. Some of these cytokines promote inflammation. Others inhibit inflammation. Body fat produces over 100 of these small proteins or cytokines. The cytokines produced by body fat are called “adipokines.” And nearly all of these adipokines promote inflammation. There has been an increasing body of scientific evidence linking many of the common diseases of aging, like arthritis, diabetes, atherosclerosis, cancer, and Alzheimer’s Disease, to chronic, low level inflammation. And circulating pro-inflammatory cytokines, as well as certain other inflammatory biochemical substances appear to play a significant role in this. That is the reason why having an excessive amount of body fat is more worrisome than ever. 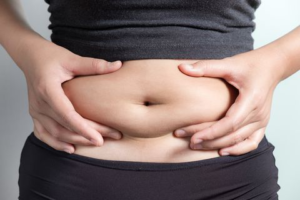 It is not just the increased weight and strain on the spine, joints, and other structural components of the body by having excessive body fat that is of concern, but also the increased systemic inflammation that results from having too much body fat. As far as pain is concerned, based upon the present scientific and clinical evidence, this much is clear: All factors being equal, if you have too much body fat, any chronic pain you have is likely to be worse or last longer. In addition to the problems associated with adipokines, it should be, at least, mentioned that the elevated insulin levels that often accompany higher levels of body fat contribute to chronic pain because insulin interacts with omega-6 fatty acids to increase production of a fatty acid called “arachidonic acid.” Arachidonic acid, in turn, can be chemically converted in the body into a number of other pro-inflammatory substances, such as certain “prostaglandins” and “leukotrienes” that are well known mediators of chronic pain. Unlike other healthcare professionals, Dr. Douglas Cancel and Performance Sport-Care will NEVER take “the easy way out” by limiting our care to insurance guideline or “one size fits all” treatment protocols. It is always better to resolve problems as soon as possible before they become chronic. And Dr. Cancel will always take the time to accurately identify the cause of injuries, identify mobility issues/strength imbalances, and determine the most effective treatment, rehabilitation and nutritional strategies to resolve or maximally cure them. Strangely enough, there are some people that “say” they want to feel better, but are actually looking for “the easy way out” of their problems. How do they do this? One way is by convincing themselves that everything has already been done for their problem. By essentially giving up, no energy needs to be expended in pressing for answers or working on alternative solutions. Another “easy way out” is the unwillingness to take a critical look at one’s own physical condition, body composition, fitness level, nutiritional practices, or exercise regimens. Should it be any surprise that their problems never get better? Dr. Douglas Cancel and Performance Sport-Care understand the economic costs, inconvenience, lost progress, extended training layoffs, and physical deconditioning that can result from unresolved injuries and chronic pain. Dr. Cancel is unique in his willingness and ability to keep our patients “in the game'” not only with effective treatment protocols, but by also retraining them on exercise form, prescribing custom rehabilitative exercises, suggesting alternate workouts, and introducing various self treatment strategies. We are a true Sports Chiropractic and Rehabilitation facility located in Walnut Creek, California. Feel free to contact us at (925)945-1155 or request an appointment.